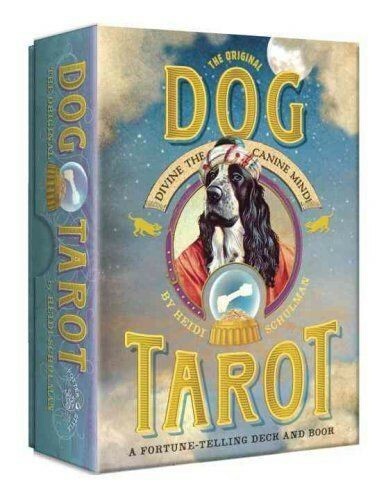 The Original Dog Tarot - Divine the Canine Mind by Heidi Schulman. The Original Dog Tarot is an entertaining deck of oracle cards with an accompanying guide book. The 30 illustrated cards are inspired by the traditional tarot deck ... Major Barkana cards include The Magician (Nostradogus), The Hydrant, The Pack and The Couch. Minor Barkana suits include The Bowls, The Leashes, The Cookies and The Bones. - Why does my dog roll in the grass 10 seconds after a bath? - How can I tell if my dog likes the TV on when I am not home? - How does my dog really feel about having her toenails painted? Each card offers advice for both canines and the humans in their lives. It is a witty and wise stand-alone oracle, affectionately written for dog owners who are still trying to master the techniques of The Dog Whisperer.